Selection of 171 Pre-Decimal and Decimal addressed illustrated FDC's from 1948 to 1970 including a few First Flight, Souvenir and Territory covers. Noted 1963-64 Navigator set. Some toning blemishes. Selection of 92 Pre-Decimal and 502 Decimal FDC's from 1948 to 1988 including handy items, several souvenir covers and some duplication. Mainly typed address WCS covers to 1975. Some Pre-Decimal covers with faults. 1959 4d Carmine-Red QEII booklet pane on unaddressed WCS FDC. Accumulation of Pre-Decimal and Decimal FDC's, including some souvenir covers with special postmarks and Foreign covers in 2 shoeboxes, plus Pre-Decimal on paper mixture in small carton. Collection of official unaddressed FDC's from 1971 to 2000 including up to 2 covers of each and a few Territory issues, plus small range of PSE's cancelled FDI. Face Value $1,536.00. Also Papua New Guinea collection of 303 official unaddressed FDC's from 1966 to 1997, including up to 3 covers of each and few souvenir covers. Several early covers with minor toning blemishes. Collection of official unaddressed FDC's from 1974 to 1992 including a few special postmarks (Face value $392.00), 173 Pre-Stamped Envelopes cancelled on FDI (Face value $58.00), 211 Maximum cards (Face value $142.00), mint and used Aerogrammes (Face value $27.00) and 1978 Blue and 1981 Brown Postcard packs. Collection of official unaddressed FDC's from 1992 to 2015 including a few earlier issues, some Australian Antarctic Territory, Christmas Island, Cocos (Keeling) Islands and joint issues, with the odd duplicate. Face Value $1,402.00. Also range of Special postmarks, PSE's, Aerogrammes and Maximum cards with a Face Value of $114.00, Selection of MUH U.S.A. stamps (Face Value US$81.00), U.S.A. FDC's (Face Value US$43.00), 2004 AFL Captain's Medallion collection and a range of stamps and miscellaneous items, from a range of countries. Accumulation of official unaddressed FDC's from 1975 to 2010, including Joint Issues, Australian Antarctic Territory, Christmas Island Australia and Cocos (Keeling) Island Australia issues. A largely complete range, with light duplication of some issues. Face Value $2,061.00. Collection of uncancelled official unaddressed FDC's from 1988 to 1997. Face Value $377.00. Also accumulation of official unaddressed FDC's, PSE's and Maximum cards from 1974 to 1997. Face Value $1,481.00. Collection of official unaddressed FDC's from 2009 to 2011 including up to 9 covers of each and a few Territory issues, plus 2010 Macquarie maximum card set (5). Face Value $1,162.70. 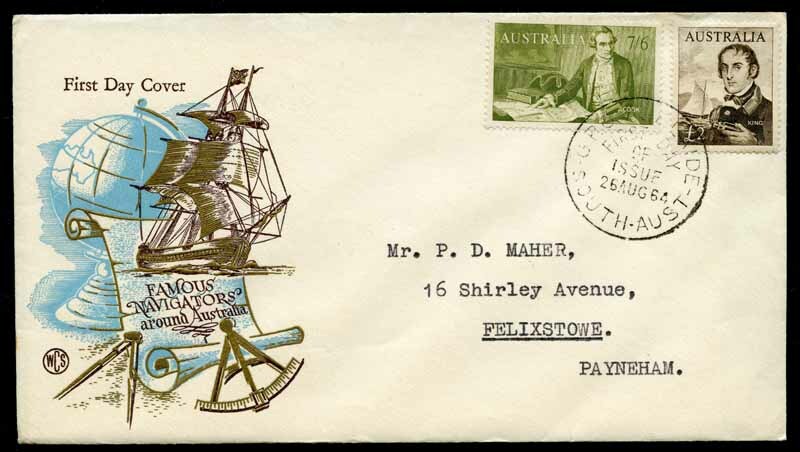 Selection of 271 FDC's from 1959 to 2006 including many base cancel sets and a few Expedition and souvenir covers, plus 10 covers stamped with Australian issues all with base cancellations from 1955 to 1957. Noted 1957-61 Pre-Decimal set of 7 cancelled at Mawson, Wilkes and Davies bases, 1966-68 Definitive set cancelled at various bases (2 sets) and 1973 Definitive set on official unaddressed FDC's cancelled at all four bases. Several covers registered. Odd fault and some early covers with toning blemishes. Accumulation of 745 official unaddressed FDC's from 1973 to 2008 including some base cancel sets and blocks of 4, plus Australia 1990 Scientific Co-operation in Antarctica set cancelled at all 4 bases. Many duplicates. Face Value $1,277.00. Collection of 230 official unaddressed FDC's from 1966 to 2005. Odd early cover with typed addressed and odd duplicate. Face Value K657.00. Largely complete collection of neatly typed addressed FDC's from 1971 to 2000 including some Regional issues and prestige booklet panes. Face Value £441.00. Selection of 24 different Prestige definitive booklet panes on official typed addressed FDC's and 4 Cotswold unaddressed FDC's from 2006 to 2014, plus 4 modern stamp and facsimile packs. Rhodesia, Malawi and Zambia collection of 103 neatly addressed illustrated FDC's from 1964 to 1971 including some duplication. Also collection of 406 Maximum cards from Austria and Portugal, plus few Canada, Faroe Islands and U.S.A. from 1980 to 1987.